President Donald Trump received an icy welcome in Pittsburgh, Pennsylvania, Tuesday while visiting the city to grieve with members of the Jewish community following a mass shooting there on Saturday. The shooting at the Tree of Life synagogue left 11 Jewish worshippers dead. 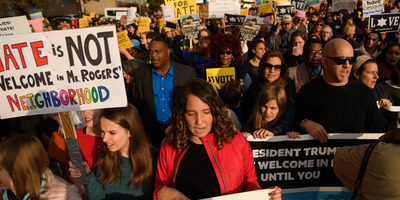 Trump earned some criticism over the weekend for comments he made after the shooting, including an assertion that the deaths could have been prevented if the synagogue had an armed security guard. 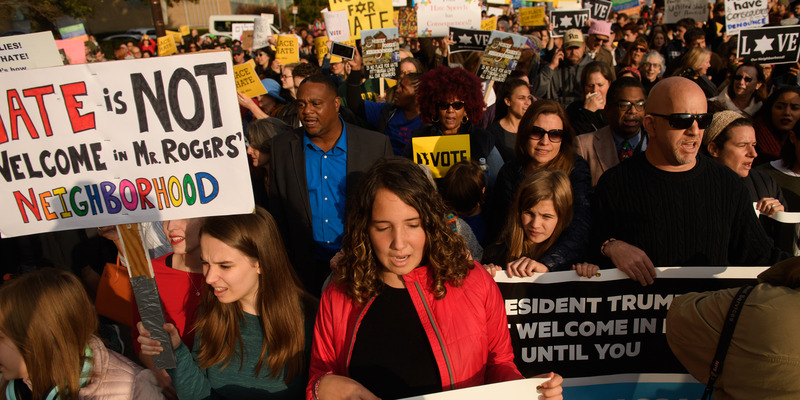 Observers gave President Donald Trump an icy welcome as he arrived in Pittsburgh, Pennsylvania, on Tuesday to attend a memorial for people killed in a shooting at a Jewish synagogue there on Saturday. Eleven worshippers were shot at the Tree of Life synagogue in the Squirrel Hill neighbourhood of Pittsburgh. “One man holding a baby shouted ‘Trump loves Nazis,'” the pool report said. “I’m a citizen. He’s my president. He is certainly welcome,” Myers said on Monday. Trump initially condemned the shooting and acts of anti-Semitic violence. Trump also drew criticism for appearing to politicize Saturday’s tragedy by reverting to talking points on gun laws in a response to questions from reporters, saying firearm regulations would have had “little to do” with preventing the mass shooting. “If there was an armed guard inside the temple, they would have been able to stop him,” Trump said on Saturday, according to CNN.